In an ever-changing world, DBAs are managing more complex, business-critical systems. The problem is the business isn’t slowing down, and budgets are getting smaller. 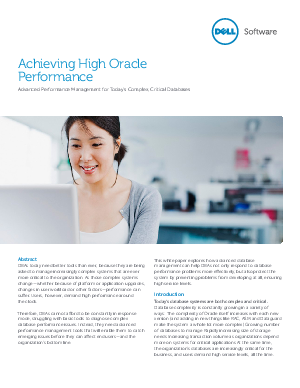 With demands of high performance and around-the-clock uptime, how can they keep providing maximum service levels? Advanced performance management is the answer. Learn more – read this Dell Software white paper.